I saw a really cute votive candle holder idea on the junk drawer blog (see the link in my blog list on the right, since I have no idea how to put the link in this paragraph LOL) . She mentioned that she purchased the votive holders at Micheal's for 60% off. Well, I couldn't pass up "cute idea" and "good sale" LOL So yesterday E and C and I dropped in at Micheal's. I obviously found a few more things than just votive holders! I didn't find the same votives that Maria found (I like hers better, but that's the way it goes sometimes), but these were pretty, and they were 60% off. You can't tell from the pic, but they are frosted glass with a clear fancy design on them. There were 4 different designs, so I had to double up on a couple of the designs. Now I just need to find a cool muffin tin. 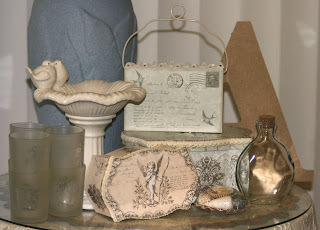 Go check out Maria's votive holder on her blog! It's so adorable! Everything in the pic was on sale except the glass bottle (which I'm going to fill with sand and shells when we visit Bear Lake next month) and the shell package (which was only 59 cents, which is as cheap as on sale LOL). I actually got the little pink/peach box for my sister (don't read that line Jeanette!). I love the shape of those boxes, so fancy! Oh, and the big "A" that you can barely see is something I plan to decorate for A's room, eventually LOL I also picked up 3 large foam stamps and 4 sets of their acrylic $1 stamp sets. And 9 little American flags, for the kids to wave and to put on the graves of both my grandfather's on Monday (they both served in WWII). I ended up with quite a bit of stuff for $30! Yippee!